This Healthy Pancake Recipe is the easiest pancake recipe in the world and each pancake has 10-13 grams of protein! Heads up! 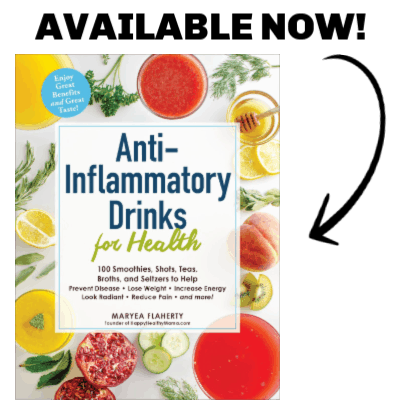 This recipe was first published February 2016. Photos and recipe notes were updated September 2018. Enjoy! Naming recipes can be such a process. I finally just settled on “Healthy Pancakes.” Yes, it’s nondescript, but let’s be honest. That’s all you need to know. A healthy pancake recipe doesn’t always equal delicious pancakes, but these are healthy and delicious. Oh, and did I mention easy? If you think homemade pancakes are a drag, think again. These are made with just a few ingredients and you can make the batter in your blender! These are some of the most hearty and filling pancakes ever. Must be the protein. These will definitely fill you up and keep you full all morning long. This video will show you just how EASY this healthy pancake recipe is! 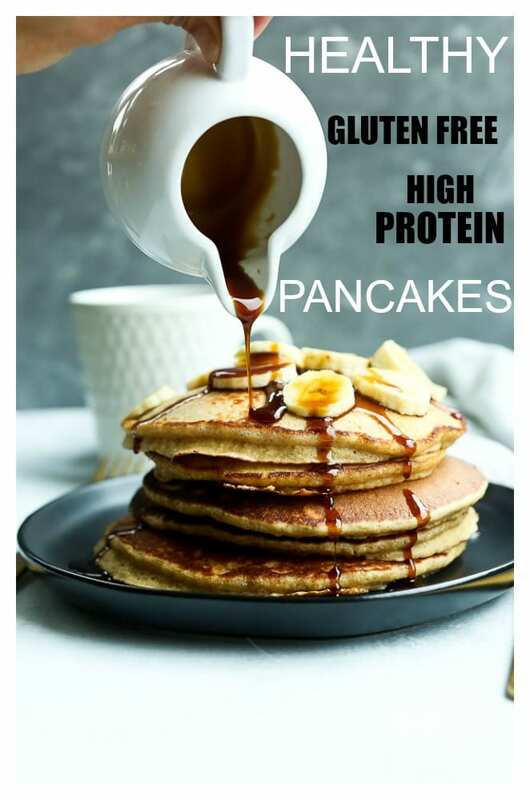 These healthy pancakes are so easy and boast 10-13 grams of protein per pancake! *After receiving feedback that the pancakes were too thin for some people, I tested the amount of oats. If you like thicker pancakes, use 2 cups of oats, for thinner pancakes 1 cup of oats is perfect. Nutritional information listed is for 1 cups of oats. If you use 2 cups of oats, 1 pancake (out of 5) is 223 calories and 13 grams of protein. 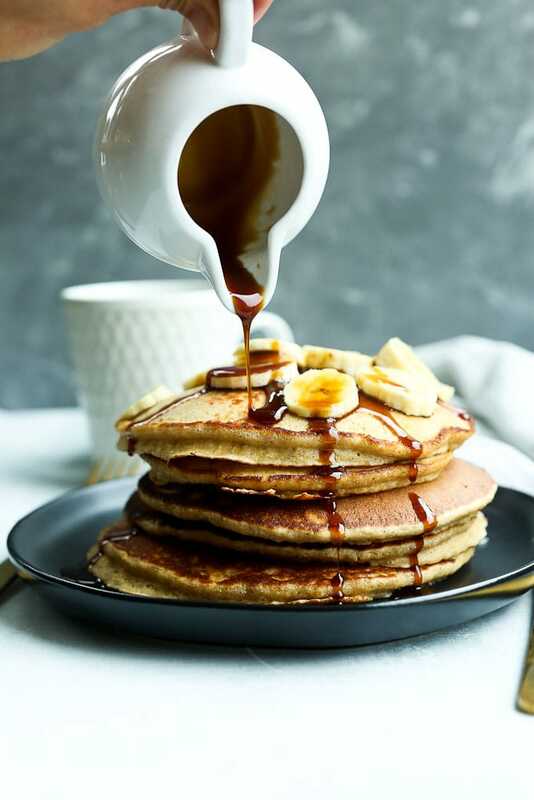 If you make this Healthy Pancake Recipe, or any Happy Healthy Mama recipe, I would LOVE to see it! Please take a pic and share it on Instagram or the Happy Healthy Mama Facebook page and tag me @happyhealthymama ? I’m the same way, Kate! 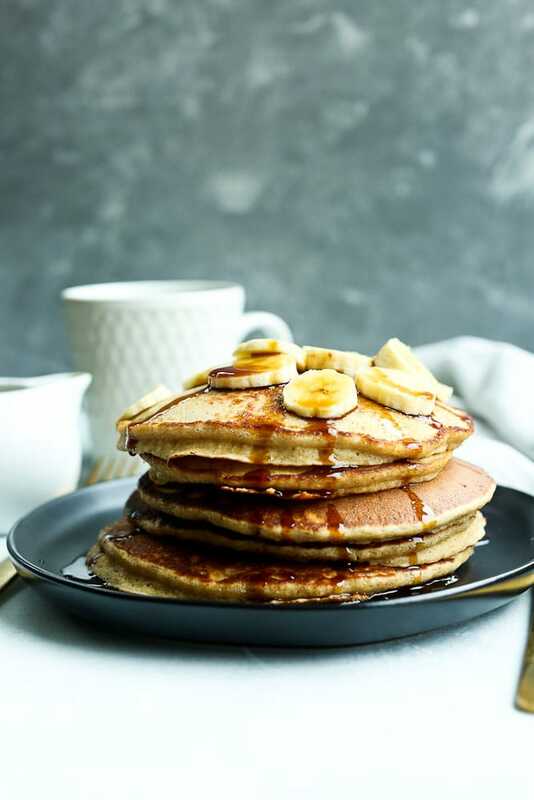 I usually think of pancakes as a special treat breakfast rather than an everyday breakfast, but these are really a game changer! I realized the protein content would be less but anyone made these with an egg replacement? Gorgeous! It looks so tasty. I will try it at home with my daughter this weekend. This might be the great time for me. Thanks. I have made these several times lately! They are so easy, and I can feel good about serving them to my 4-year-old. We don’t even add any sweetener and he loves them, usually topped with peanut butter. Thanks for sharing delicious and healthy recipes.. I have read many healthy protein pancake reviews, but this one looks yummy!! I am very eager to try these delicious pancakes. Do you know approximately how much batter you use per pancake and how many pancakes you get total? It says serves 5, but I am wondering how many pancakes each person gets. Looks so good and I have all the ingredients in my pantry. I’m trying these tomorrow. Thanks. I just made these for myself and my three teenage daughters, and we loved them. I doubled the recipe for the four of us and used whole milk Greed yogurt (because that is all I had). I served them with (yes more) Greek yogurt, fresh berries and maple syrup on the side. I cooked them on low medium heat with the lid on, and they came out fluffy. I appreciate that they are so nutritious, took very little time, and of course delicious. I will definitely make these again. Rolled oats are oats that have been rolled. 🙂 Rolled oats are sold as either old-fashioned rolled oats or quick-cooking rolled oats. I use old-fashioned. I hope that helps! In Canada they are called “large flake oats.” In the US they are called “old fashioned oats.” Same thing. Not sure where you live. Delicious recipe! I made it yesterday. Its taste was delicious. These are the best pancakes I’ve made probably ever. Usually “healthy” recipes eliminate any sort of flour and end up rubbery and paper thin or call for almond meal which makes them dense and gritty. These were fluffy and filling but didn’t weigh me down like pancakes often do. I had to work with whole wheat flour and plain yogurt because that’s what I had on hand, but they were soooooo gooooood! These have become my all time favorite pancakes! They taste great with some fresh strawberries and a bit of natural maple syrup. Or a bit of natural peanut butter spread over the top. Love doing a double batch so I can freeze the extras. it’s so good and so healthy i love it! it’s so good and so healthy!!! i love it! it looks yummy. I think I will have a try according to your suggestion, thanks. These are so good. Just made them quickly with my 18 month old, he keeps asking for more, more, more! We eat gluten free, so a recipe without flour is awesome, since even the 1:1 ones are never quite right! Looking forward to trying these! Are the nutrition information for one pancake or for the whole batch? These are really, really good! I’ve done a couple of variations out of necessity—sour cream thinned just a little with milk when I don’t have green yogurt, or blueberry Greek yogurt when I don’t have plain. Those were very yummy, with just a hint of flavor from the flavored yogurt. I also pulse the oats in the blender by themselves to get them much finer than they are. I think this may cause them to be a little flatter, but my kids get all weird with full-sized flakes of oats in their pancakes. I’ve tried so many different healthy pancake recipes that have failed. I am so happy I decided to give it one more shot with this one. No more scrambled pancake. I love it! Thanks for the feedback Julzs! Hi. Made these today. The batter looked a bit thin, so I added more oats, still thin, but they cooked up alright. They were not as fluffy as the ones pictured. However, they were delicious. Do you think the thinness was due to extra large eggs. Maybe 2 of those instead of the three. What do you think? Did you use Greek yogurt? I’ve made these with regular yogurt and they were thin. The eggs could have caused it, also, but I’m not sure. If you used Greek yogurt, definitely try them with 2 extra large eggs. These are very good. I used almond milk yogurt and added sliced bananas and walnuts when cooking. Loved them! I used about 1.25 cup oats. These were light but so filling! I have been looking for a good protein pancake without protein powder and this one was perfect! I like thin pancakes too, so the 1 cup of oats was great for me. Thank you! Yum! Great recipe. I added mashed banana to the mix too which worked really well. Thanks! I was already using the fork attribute. I added the memory attibutes and it worked like a champ! This looks delicious. Well, I love Pancakes…!! Thanks for your recipe love.